What’s the Matter with Today’s Experimental Music? is based on the premise that contemporary music is suffering from a distinct lack of attention. It inspects and evaluates what is happening to musical experimentation, where things might have gone wrong and what can be done to resolve the problem. 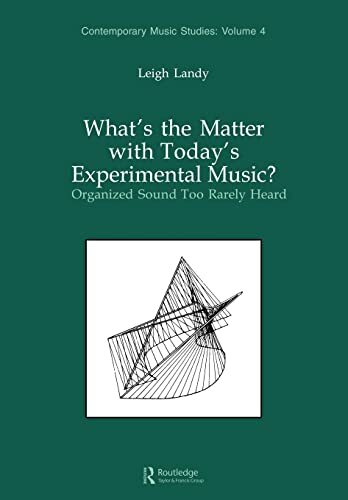 Intended as a supplement to surveys of music of the last forty years, it discusses not only the problems of musical content, but also problems of an extra-musical nature. Today’s education and communications media are seen to be the main cause of the anonymity of contemporary music and suggestions are made to improve this situation. Leigh Landy investigates audio-visual applications that have hardly been explored, new timbres and sound sources, the discovery of musical space, new notations, musical politics, and the ‘musical community’ in an attempt to incite more composers, musicians and musicologists to get this music out into the works and to stimulate the creation of new experimental works.